Of The Six Sandarbhas, Tattva Sandarbha is the smallest in size, but not in importance. As its name suggests, it discusses the Reality (tattva) that is the ultimate subject to be understood and realized. Tattva also means "essence," and thus Tattva Sandarbha provides the essence of what is to be elaborate upon in the rest of the Sandarbhas. For this reason, it serves as an introduction to them and lays the foundation for entry into the subject matter of Bhagavata Purana, a detailed analysis of which follows in the rest of the Sandarbha. It does so particularly by providing the epistemological viewing frame through which Bhagavan is directly intuited, devotionally served, and established ultimately as the supreme object of divine love. 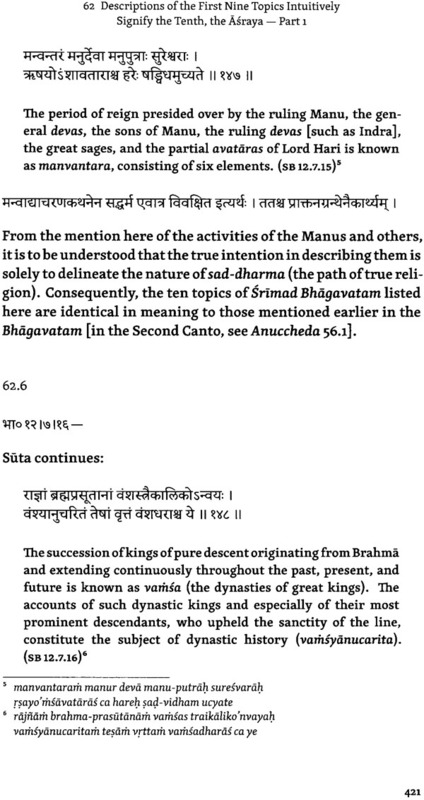 The Essential Message of The Bhagavatam, or in other words, the self-disclosure of its essential truths of sambanbha, abhidheya, and prayojana, is found in the verses narrating what Srila Vyasa witnessed in the state of unmediated trance-beginning with the supreme subject, Bhagavan, who was seen to be inclusive of His own intrinsic potency as well as His subordinate extrinsic potency, maya. 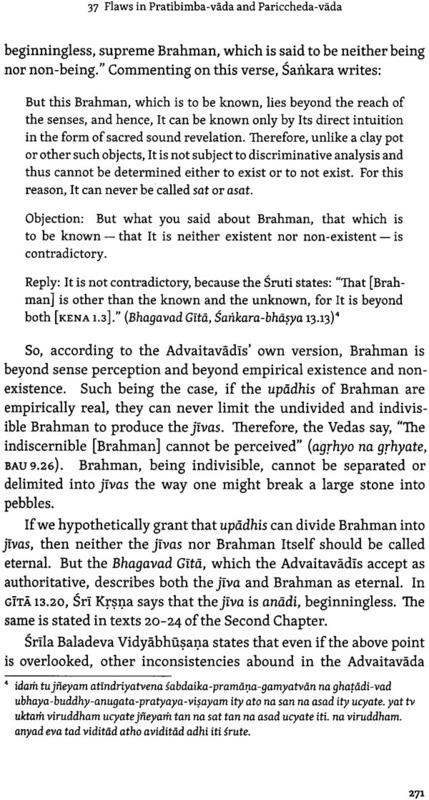 What was disclosed to Vyasa was not a non-differentiated Brahman being overpowered by maya and turning into many jivas. Rather, He saw that the jiva is distinct from Bhagavan and is captivated maya because of misidentifying the self as independent of Bhagavan. Vyasadeva thus saw that the cause of the jiva's suffering is this false sense of independence born of misplaced identity. In one and the same vision, the means corresponding to the inherent distinction between the jiva and Bhagavan was revealed to Vyasa. He was that the solution to the jiva's predicament is the total offering of the self in devotion to the Supreme Person (bhakti-yogam adhoksaje), not imagining a state of oneness with Him. Born In 1954, he was drawn to the spiritual traditions of his home country India since his childhood. After receiving a postgraduate degree in 1978 from IIT Delhi, he then worked in the United State for four years. After this period, he returned to India to begin formal study of the orthodox systems of Indian philosophy known as sad-sarsana under the direct guidance of his guru Sri Haridasa Sastri Maharaja and Svami Syama Sarana Maharaja. This education was pursued in the traditional manner for more than 25 years as he dedicated himself to the practice of bhakti-yoga. In 1991 he accepted the traditional Vaisnava order of renounced life, babaji-vesa. His main focus has been on the works of Jiva Gosvami, particularly the Sat Sandarbhas, providing English translation and commentary. He also earned four sastric degrees, and received both a law degree and a PhD in Sanskrit from Agra University. Satyanarayana Das is the director of the Jiva Institute id Vaishnava Studies in Vrindavan, India. In 2013 he was honoured by the president of India, Pranab Mukherjee, for his extraordinary contribution in presenting Vedic culture and philosophy to students and audiences within India and internationally. For Thousands Of Years, India has been the land where people have molded their lifestyle in pursuit of spiritual realization. Many types of spiritual practices and theologies were developed, experimented with by religious specialists, and taken up by the masses. It was generally accepted that the ultimate goal of human life was to access direct experience of Absolute Reality. Every aspect of human life, be it economic, social, political, moral, or religious, was designed to facilitate this ultimate aim. It is for this reason that knowledge systems or schools of thought were called darsana (lit., "vision"). Today the word darsana is often translated as "philosophy" or "school of thought," but that fails to capture its true meaning. Darsana signifies the vision of Reality. A darsana is a system that explains Reality, both empirical and transempirical, how it relates to the conscious self, and also provides a map of the path one can adopt to actualize moment to moment direct visioning capacity of that Reality! Books like the Sat Sandarbhas were written to help religious practitioners gain intuitive insight into Absolute Reality. In academic circles, however, there is a tacit consensus on remaining objective about religious studies. This "knowledge for its own sake" acts as a barrier preventing the investigator from directly accessing the interior states disclosed by realized authors of religious works. Such studies may serve academic goals without touching the spirit of the book or conveying the true intent of the author"
In presenting the Sat Sandarbhas, written by Jiva Gosvami, I have not been tied to any such constrictions. Being a practitioner of Gaudiya Vaisnavism, my comments represent the viewpoint of an insider who was educated in the Gaudiya tradition. I have tried to preserve the intention and spirit of' Jiva Cosvami. My commentaries are written primarily for adherents of Gaudtya Vaisnavism to help them fully comprehend its basic tenets so they may follow the path properly and achieve success. Correct understanding fortifies a person's faith and supports effective practice. Improper understanding leads to wrong practice and a failure to achieve the desired outcome. It therefore be hooves every practitioner of Gaudiya Vaisnavism to study the Sandarbhas carefully. It makes a world of difference when practice is undertaken with an accurate understanding of the subject. Our human life is limited; time elapsed does not return. Therefore, we have to use it judiciously. In Snmad Bhagavatam (11.29.22), Sri Krsna teaches that the real intelligence of the intelligent and the wisdom of the wise is to utilize the temporary material body to attain the Eternal. Thus, it is of utmost importance to gain a clear understanding of the darsana, so that one may walk with unfailing vision toward the destination. To give an example, even if you have a superb car in perfect condition, are a trained driver, driving on an excellent highway, and are alert, you will still end up in the wrong place if you have taken a wrong turn. Alternatively, even if you are walking leisurely on a dirt road, you will reach your goal sooner or later, as long as you are walking in the right direction. Every step you take brings you closer to the destination. Thus, the proper orientation to Reality is necessary for a sincere and serious seeker and practitioner. Some sadhakas (those who undertake a specific spiritual practice) argue that the emphasis on discriminating scriptural knowledge is relevant only to the path of jnana (knowledge) and has nothing to do with bhakti (devotion). This is a gross misconception. If such were the case, Jiva Gosvami and other acaryas would not have labored so rigorously to write an abundance of literature. They were certainly not confused about the difference between bhakti and jnana. Knowledge related to bhakti is also an integral part of bhakti and has nothing to do with jnana-marga, the purpose of which is quite different. In fact, hearing (sravalfa), which includes studying sastra via the faculty of human rationality (manana), is the first limb of bhakti. Then there are others who opine that there is no need to study sdstra, because bhakti itself, such as chanting the divine Names of Krsna, will reveal everything. But how is this conclusion arrived at? Either it is known from sdstra or from somewhere else. If the latter option is the case, then such an understanding cannot be taken as authentic. If it is known from sdstra, such protagonists must accept the importance of sastric knowledge and concur with the perspective that discloses its central importance. Furthermore, the idea that all knowledge is revealed through chanting of the Name is itself a scriptural teaching on the Name meant to emphasize its extraordinary power, not to minimize the importance of scripture. Moreover, it is from sdstra itself that the very process of authentic chanting is to be learned. Indeed, sdstra provides a complete view (darsana) of the Supreme Reality and of the means of Its attainment through bhakti. It is this vision alone that can make possible genuine devotion in any of its forms. So why would any serious aspirant to true knowledge of and love for God neglect to study the sdstra as a whole? Another question that must be addressed in response to sddhakas who argue that scriptural knowledge is irrelevant to bhakti is this: Without authentic scriptural knowledge, how can a practitioner truly know what bhakti is and how to execute it properly? Authentic knowledge of bhakti can be known only from sdstra. One's practice must be aligned with the true understanding of the goal. On the yoga path, faulty practice of dsanas (physical postures) or incorrect prd1)dydma (breathing exercises) is likely to damage one's body or vital system over the course of time. In the same way, on the bhakti path, a perspective that is not recognized as valid and not aligned with the goal will not yield the desired result, but can cause mental and spiritual complications. Regular practice improperly performed may be slow to deliver its detrimental consequences, but in the long run the cumulative repercussions are significant. It is comparable to making use of a powerful and appropriate medicine, yet doing so in an unprescribed manner. Millions of people pursue the path of bhakti; yet, even after decades of practice, only a few of them are observed to have arrived at or near the goal. If an astute business person is not gaining success, or a dedicated athlete is failing to achieve his desired goal, then that person will analyze the cause and look to correct himself. He will consult an expert or a coach in his field. Similarly, it be hooves a sincere seeker of Reality to do the same thing and investigate the cause behind one's lack of progress. The most likely reason is either deficiency in, or incompleteness of, one's root understanding and outlook, which inform and pattern every detail regarding self-concept, God-concept, life-view, and the practice of devotion. Authenticity of practice can arise only from a genuine understanding of Reality, process, and goal. Since Sri Jiva composed the $at Sandarbhas to make both the process and the goal crystal clear, there is a great need to study these texts. They have served practitioners for centuries and represent a thoroughly tested and validated body of evidence. Previously this knowledge was locked in Sanskrit and not many had access to it. Now it is available in English and a sincere seeker should take advantage of it. If one is dedicating time and energy in pursuit of one's goal, one will fare better if one clearly understands the pro- cess as well as the goal. The $at Sandarbhas award this knowledge, dispelling all doubts. In 1995 the Jiva Institute published its first edition of Tattv a Sand a- rbha, which is the first book of' jiva Gosvami's Sat Sandarbhas. This new edition has been completely revised from start to finish. The entire text has been re-translated from the Sanskrit, employing vastly updated language to better represent the subtlety, depth, and complexity of Jiva Gosvami's thought. Some of the most important terms introduced in this new translation have been explained in the article entitled, The Language of Transcendence - Key Terms and Concepts, found in the references at the back of the book. The reader is recommended to go through this essay first before reading the main body of the book, as it will greatly facilitate accurate understanding of the text. In this edition special attention has been given to the topic of epistemology, which is the beginning point and foundation of Sri Jiva's exposition. In particular, the significance of sabda, or the Vedic sound revelation, has been brought to light, not as mere scriptural or canonical authority, but as transhuman (upuuruseyc), self-revealing sound, identical with the truth that it signifies. This insight is of tremendous importance not only for the correct understanding of this volume and the others in the series, but to access immediate knowing of Bhagavan, which leads to the self-revelation of the means of His worship and the goal of divine love. Many of the original commentaries on the anucchedas of Jiva Gosvami have been enlarged or rewritten to accommodate the refinement in understanding. 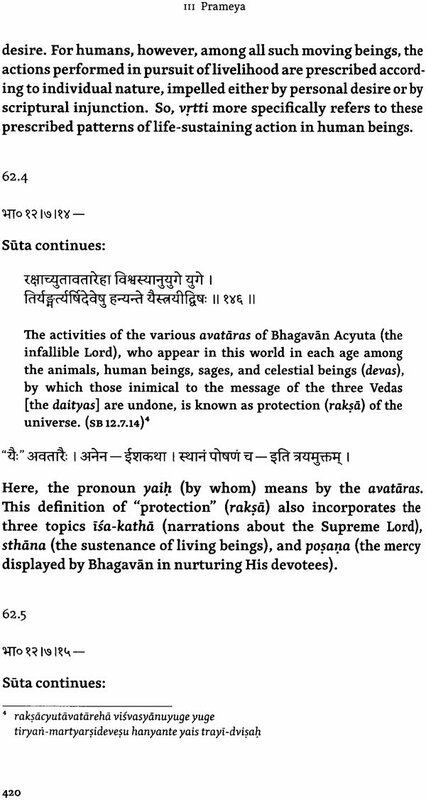 In translating and commenting upon the text of Tattva Sandarbha, I have followed the Sanskrit text from the edition of my guru, Sri Sri 108 Sri Srotriya Bhagavad-nistha Srtmad Haridasa Sastri Maharaja Nava-tirtha. I also consulted the editions of Puri Dasa, Sitanatha Gosvami, and Nityasvarapa Brahmacari to establish the proper reading. I have provided detailed explanations of each anuccheda based on my study of the Tattva Sandarbha and the rest of the Sandarbhas with my guru, as well as on the basis of [Iva Gosvami's own commentary, Surva-snmvddinl, and the commentaries of Sri Baladeva Vidyabhusana and Radha Mohana Gosvami. In addition to the above, the entire book has been reorganized into topical divisions in exact accordance with Jiva Gosvami's over- all view. This master plan can be readily accessed from the Contents, which serves as a map to help guide the reader through the book, as well as from a chart included in the references entitled Tattva Sandarbha at a Glance. The divisions of the book have been titled to help the reader grasp the topics under discussion. 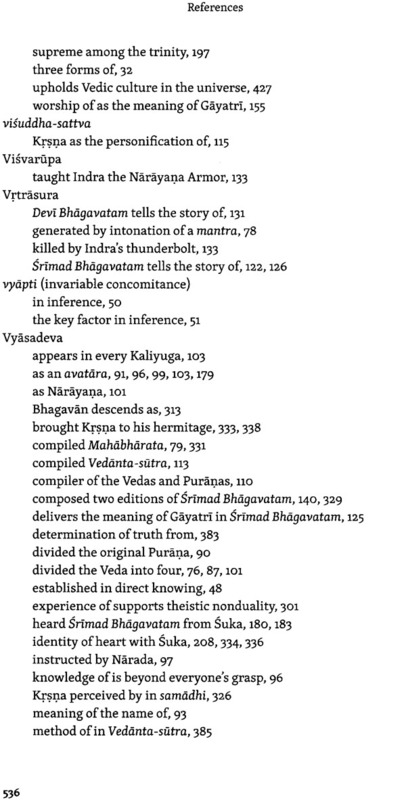 In the main body of the book, explanatory texts have been inserted to introduce the subject of each division. In particular, the determination of sambandha, abhidheya, and prayojana from the transcognitive state of awareness of Srila Vyasa and Sri Suka, has been given the place of prominence that it deserves - an observation that went almost entirely unnoticed in the first edition. This determination is a key topic that mediates between epistemology and the elaboration of ontology proper. It informs us that the knowable (prameya), like the means of knowing itself (prcmdna), is self-revealed and not a matter of mere metaphysical speculation or logical thought construction. The new revised edition of Tattva Sandarbha is indispensable to grasp the methodology of [Iva Gosvami and the map of Reality he has provided throughout the $at Sandarbha. 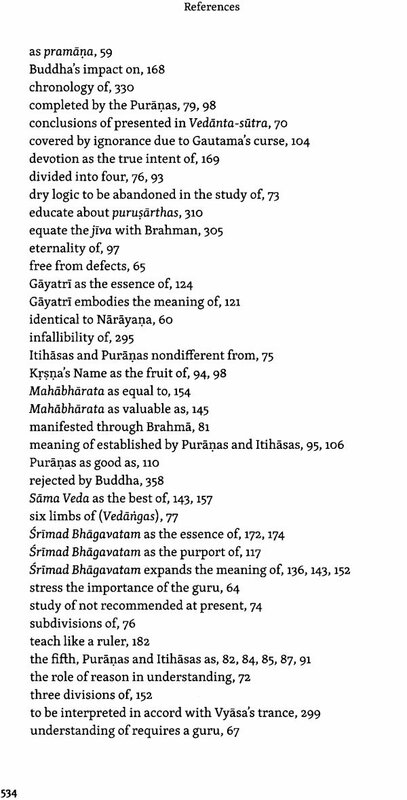 Jiva Gosvami's anthology offers the most systematic and complete synthesis of Vedanta. Consequently, the highest benefit to the reader can be had by following the order intended by him. This new Tattva Sandarbha will thus greatly facilitate the understanding of the Bhagavat Sandarbha and the volumes that follow, enabling the direct knowing of Bhagavan on His own terms. Sri Jiva Gosvami has rendered tremendous service to the world community of devotional transcendentalists by writing the $at Sandarbhas. His exposition takes a beginner by the hand, guiding him or her to the ultimate goal of priti, or divine love. He wrote it specifically for those who aspire to enter the relation of transcendental service in love. My commentaries have been written keeping that goal in mind. I have relished working on them. Doing so has also deepened my understanding and intuition about the subject. Thus, if the reader is similarly benefited, I would consider my endeavour doubly successful. The Will To Know is one of the most powerful and sustaining instincts in human beings. It begins at birth and continues as one develops self- and then external awareness. Every normal human being is equipped with the impetus to expand his or her experience and insight. The basic instinct for cognition is crucial to our survival as well as to achieve happiness. The urge to know manifests in all aspects of life. In modern times, an individual requires knowledge in many areas in order to make informed decisions about what food to eat, where to live, who to vote for, how to manage finances, how to lead a spiritual life, and so on. Cumulative knowledge resulting from this fundamental instinct results in many fields of study, such as biology, sociology, environmental science, political science, economics, psychology, and philosophy. Although the instinct to know is universal and not limited to any particular country or race, different fields of knowledge develop in different societies, depending on the inclination and corresponding needs and interest of the people. India has traditionally been a fertile ground for various schools of theology and philosophy. 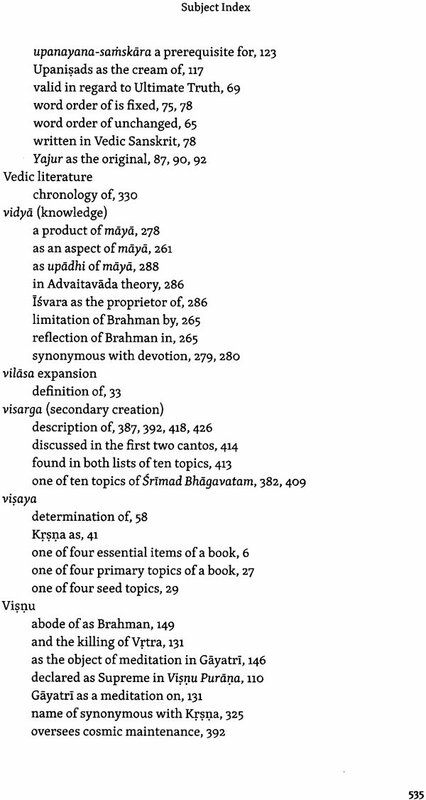 The Vedas, the world's oldest scriptures, contain the seeds of numerous systems of thought that later developed into specific and well-defined schools. As a whole, the Indian wisdom schools can be divided into two groups, those that accept the authority of the Vedas and those that don't. This division is not based on belief in God. The six schools that accept the authority of the Vedas are Nyaya, Vaisesika, Sankhya, Yoga, Purva-mimamsa, and Vedanta. Of these, Vedanta is the most widely studied and practiced. Within Vedanta are various sub-schools, with the most well-known being the Advaita Vedanta School popularized by Sri Sankaracarya. Another sub-school is that of Vaisnavism, of which the youngest denomination is Gaudiya Vaisnavism (also known as Caitanya or Bengali Vaisnavism), which has drawn a great deal of attention from Western scholars in modern times. Every school has its own distinctive tenets and practices. Gaudlya Vaisnavism marks a significant development in the theology and praxis of divine love. This development is not the out- come of a single person's work, but resulted from the concerted effort of a group of scholars who were followers of Sri Caitanya Mahaprabhu (1486-1534), the founder of the school. Of these, the Six Gosvamis of Vrindavan, namely, Sanataria, Rupa, Raghunatha Dasa, Gopala Bhatta, Raghunatha Bhatta, and Jiva Cosvami, were the most prominent. Among them, only Raghunatha Bhatta didn't compose written works. The rest wrote books concerning devotion to Sri Krsna. Jiva Gosvami (1513-1608): the youngest of the six, was the most prolific. He wrote a number of works, some of them voluminous, dealing with almost all branches of Vaisnava literature. It is he who systematized the teachings of SrI Caitanya and gave shape to the Gaudiya Vaisnava School on a par with other Vaisnava schools, such as those founded by Sri Ramanujacarya, Nimbarkacarya, Mad- hvacarya, and Vallabhacarya. 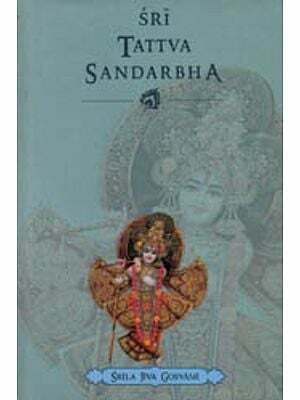 of all his works, the $at Sandarbhas, along with his own commentary Sarva-samvadinI, are well known for their deep analysis and systematic elaboration of the entire theology and philosophy of Gaudiya Vaisnavism. The original name of the Sat Sandarbhas was Bhagavata Sandarbha, indicating that it is an exposition and analysis of the essential message of Snmad Bhagavata Purdna. 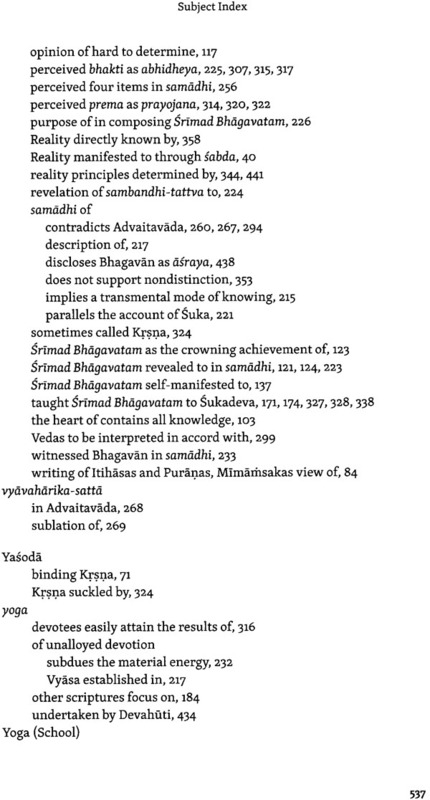 The traditional criteria by which a Vedantic School came to be recognized as authentic was that it had to establish its philosophical tenets on the basis of the prasthana-trayi (lit., "the three great high- ways"), which consists of the ten principal Upanisads, the Vedanta-sutru, and the Bha9avad Gita. Every sampradayaS had to deduce its basic tenets, or siddhCinta, from these works. Sri Caitanya Mahaprabhu, however, placed utmost importance on Srimad Bhagavata Purdna, which He called the flawless Purana. He proclaimed it as an explanation of the Veddntu-sutrc written by the author Himself, Sri Vyasa. 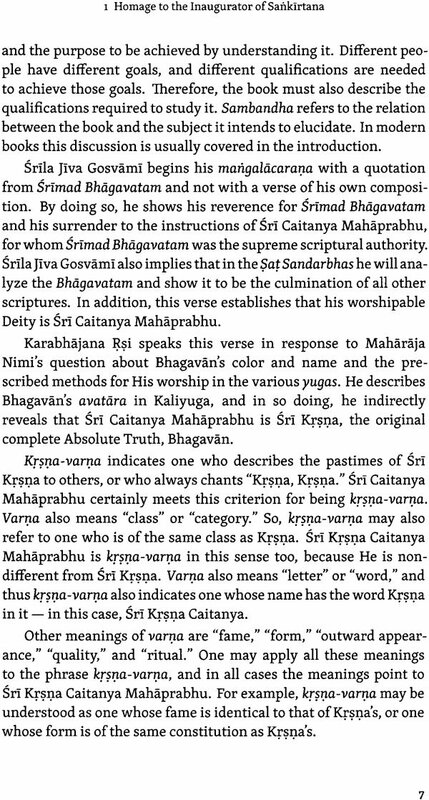 Since Srimad Bhagavatam fully represents SrI Caitanya's own doctrine.' His followers did not attempt to write commentaries on the prasthdnu-trayt, but instead wrote commentaries, essays, and independent works on Snmad Bhagavata Purdnc. 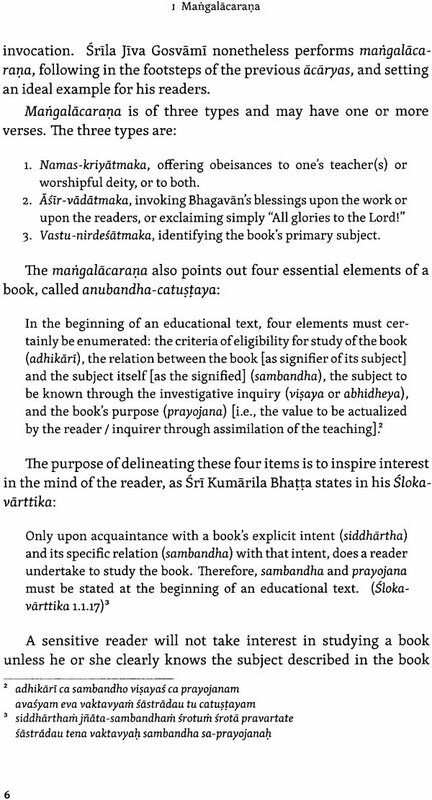 Sri Vallabhacarya was the first to include the BhCi9avata Purdna, which was self-revealed in the samadhi of Vyasa, as part of sabda-prumdnn, or Vedic testimony, along with the prasthana-trayi? Jiva Gosvami, however, went a step further, declaring: "So it is that we shall focus our investigation exclusively on Srimad Bha9avatam to determine, free from any inconsistency between preceding and following statements, the ultimate value for human beings" (Tattva Sandarbha, Anuccheda 27). 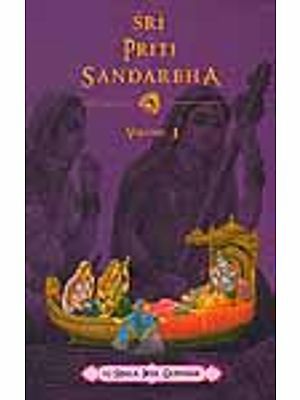 A literary work that discloses the confidential meaning of a subject or book, incorporates its essence, explains the superiority of the subject, and elaborates its various meanings, is called a sandarbha. 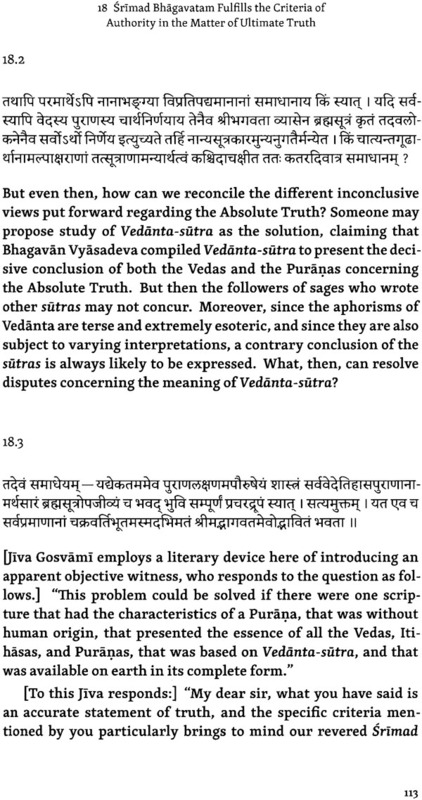 Sri Jiva Gosvami called his work Bhcigavata Sandarbha, it being an independent essay and elaborate analysis of the subject of the Bhcigavata Purdna. It is not a running commentary on Bhcigavata Purdna but an explanation of selected verses to illustrate its essential message. 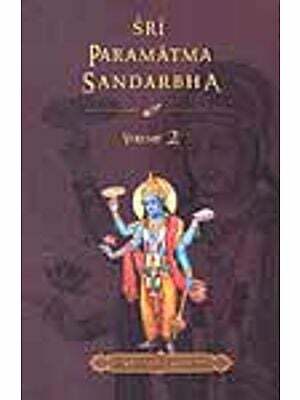 Jiva Gosvami also wrote a commentary on the complete Purdna, called Krama-sandarbha. Bhcigavata Sandarbha is popularly called the Sat Sandarbhas, because it consists of six (sat) books, namely Tattva, Bhagavat, Paramcitma, Krsna, Bhakti, and Priti Sandarbha. 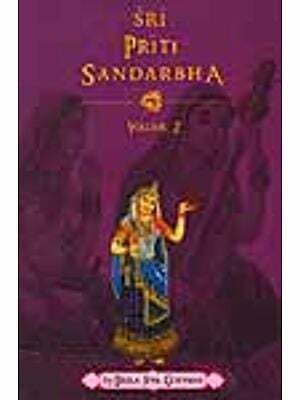 Another book, Sarva-amvddini, is a self-commentary and a supplement to the first four of the $at Sandarbhas. It elaborates on some topics that were either not explained clearly or left out completely in the original work. The sage Sri Vyasa, a Visnu avatcira who is celebrated as one of the greatest sages in India, organized the original Vedas into four works and wrote eighteen Puranas, Vedcinta-siltra, and Mahcibhci- rata. Even after accomplishing all this, He remained dissatisfied, feeling as though something was lacking in His mission of providing knowledge to humanity for their spiritual upliftment. While Vyasa was thus affected by despondency, His teacher Sri Narada appeared at His cisrama. Following Sri Narada's instruction, Vyasa meditated to the point of samcidhi, and while in that state of spiritual trance, the original Supreme Person, Bhagavan, self-manifested to Him. Based on this experience, He produced Srimad Bhcigavatam, His ultimate work. 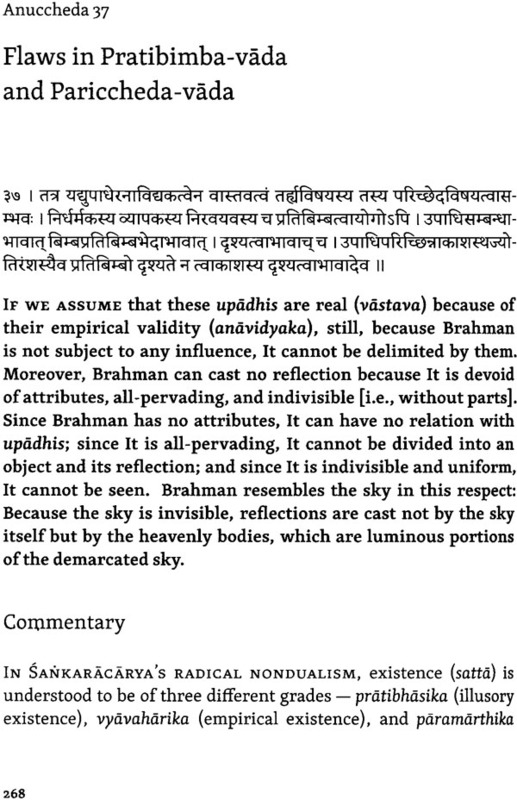 According to Vyasa, Srfmad Bhcigavatam is an exposition of Absolute Reality and the essence of the Vedas (SB 1.1.3). This is also corroborated by Suta Cosvaml (SB 1.3.42 and 12.13.15). The $at Sandarbhas are the most thorough and systematic presentation of the philosophy and theology of Srimad Bhcigavatam. Before their composition, many works were written on Srimad Bhcigavatam, but none is as exhaustive and in tune with its spirit. 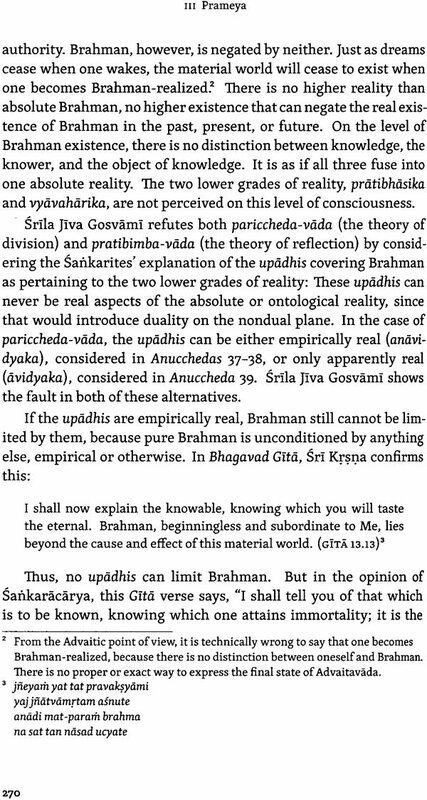 Proponents of the earlier Vaisnava schools had refuted the Advaitavada doctrine of Sankaracarya, showing it to be but a onesided and prejudicial view of the Upanisadic revelation. They commented on the prastiuuia-trayi and explained them to establish that Ultimate Reality is not without form and attributes. Even though Sri Jiva Gosvaml also did not agree with Sankaracarya's radical interpretation of Advaita, he did not directly refute his views by commenting on the prusrhdna-trcyi, as had been done by senior Vaisnava dcdryas, such as Sri Rarnanuja and Madhvacarya. Instead, Jiva Oosvami adopted a novel approach to establish his conclusion about Ultimate Reality. On the basis of the descriptions found in Bhagavata Purdnn, he analyzed the precise nature of the truth disclosed in Vyasa's trance as well as the direct testimony and realization of its highly enlightened speakers, and showed that all of these "truth-knowers" directly realized the personal form of Bhagavan as being the support and shelter of Brahman as well as Its final completion. Sri Jiva concluded that the Ultimate Reality alluded to in Veddntu-sutm could not be different from that depicted in Bhdgavata Purdna, since both were written by Vyasa, For this reason, he analyzed BhCigavata Purdna to ascertain the Ultimate Reality, the means of Its realization, and the supreme goal to be attained in relation to that Reality. He adopted this unique strategy, because the meaning of Veddntu-surrc, which is liable to contradictory interpretations, is explicitly found in Bhagavata Purdna. 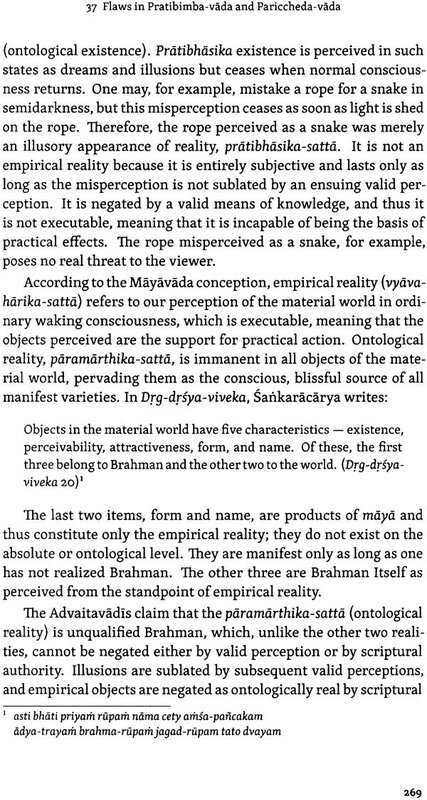 1.Tattva Sandarbha, besides establishing the authority of the Bhdgavata as epistemologicalmeans (prcmdnc), also determines the knowable (prameya), offering a brief overview of Gaudiya Vaisnava ontology, on which its theology is based. 2.Bhagavat Sandarbha describes Bhagavan, the Supreme Person, as the most complete manifestation of nondual Reality, inclusive of Brahman and Paramatma, It also describes His diverse energies, qualities, name, form, associates, and abode as intrinsic aspects of His essential being. 3.Paramdtma Sandarbha describes the specific manifestation of Bhagavan called Paramatma, or the Immanent Self present within everything. He is both the source of creation, as conscious ground of awareness and being, and the ingredients of creation, in the form of His extrinsic power of phenomenal being. His regulation of the cosmos occurs automatically or as a mere by-product of His entrance therein out of His own lila, which is concerned instead with His devotees. This Sandarbha also elaborates the ontology of the living beings and primordial nature as distinct potencies belonging to Paramatma. 4.Knl)a Sandarbha identifies SrI Krsna not only as Bhagavan but as SvayariJ. Bhagavan, the Supreme Person in His own original form and essential being. In technical terms, SvayariJ. Bhagavan, or "God as He is in Himself," signifies the nondual personal Absolute in His own original, complete, and all-encompassing form as the source of all other manifestations of Godhood. 5.Bhakti Sandarbha delineates the intrinsic nature of unalloyed bhakti, the means of its reception, how it is distinguished from adulterated devotion, and the various methods by which it is executed. Jiva Gosvami demonstrates how pure bhakti fulfills the criteria as the ultimate means to realize the Absolute in Its most complete identity as Bhagavan. By showing conclusively that bhakti alone is the essential and effective ingredient in all methods of realization, it is evident that without it, no other process can yield even its own professed result. 6.Priti Sandarbha illustrates that love of Bhagavan, prlti, is the ultimate goal attainable by conscious beings. After an elaborate analysis of the fundamental nature and constitution of prlti, Sri Jiva Gosvami concludes that only pnti can lead to the complete fulfilment of the self's potential, fully disclosing the state of supreme bliss (paramdnanda). 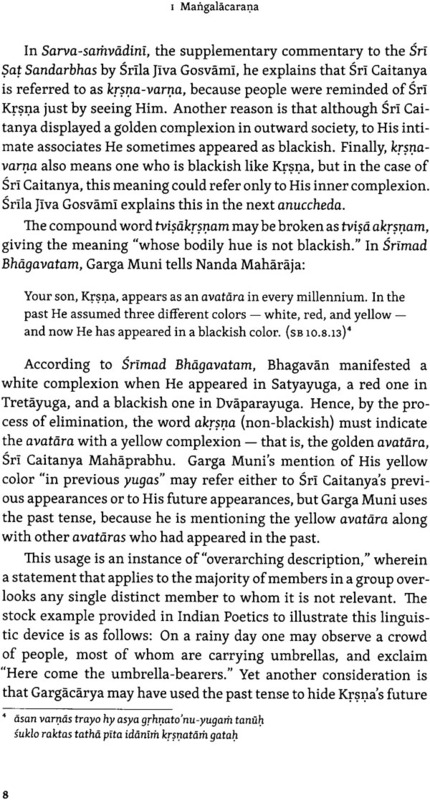 Through his exhaustive and clear exposition of metaphysics in the Sat Sandarbhas, Sri Jiva Gosvaml provided the Gaudlya Vaisnava School a distinct identity of its own, contributing to Vedanta a unique take on theistic no duality. He drew freely from the entire heritage of' Vaisnava philosophical thought available to him. Without exception, all the important insights Sri Jiva brought to light were supported with scriptural references; yet, his conclusions are not mere repetitions, but bear the mark of originality and deserve independent consideration. Sri Jiva Gosvami labored meticulously to present this wonderful analysis of the "spotless Purana" for those serious students who truly aspire to attain pure devotion for Sri Krsna. Without earnestly studying the Sandarbhas, one would find it difficult to ascertain the essential theological principles found in Srimad Bhagavatam. Since Sri Jiva Gosvami writes specifically for the devotees of Krsna, as he clearly states in the beginning of Tattva Sandarbha, he does presume a prior disposition of faith as a given in those for whom his exposition is being made. This does not indicate a lack of scholarship or realization on his part, as some critics suggest. It signifies, rather, that his method and purpose lay beyond the range of what is accessible through dry scholarship alone, devoid of the unmediated awareness of un alloyed devotion. Scholarship for him is relevant only in the sense of earnest investigative inquiry into truth leading to immediate realization. His erudition, however, is clearly evident from the range of original books and commentaries he wrote for the Vaisnava community, including a Sanskrit grammar. Disregarding the significance of his statement in the beginning of Tattva Sandarbha concerning eligibility, many modern scholars have severely criticized his description of epistemology. It seems that his establishing the Bhiigavata Purdna as a book par excellence has irked their sensibilities.